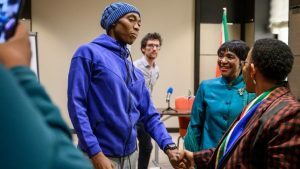 South African ambassador to the United Nations, Nozipho Mxakato-Diseko has called for the Human Rights Council to intervene and take action against the International Association of Athletics Federations (IAAF), as it deals with world and Olympic champion Caster Semenya‘s case. This is as Deputy Minister of International Relations, Luwellyn Landers participates in a series of meetings at the High-Level Segment of the United Nations Human Rights Council (UNHRC) 40th Session in Geneva, Switzerland. The HRC meets against the backdrop of numerous challenges in the world that impact on human rights, peace and security and development. Mxakato-Diseko says the Human Rights Council has highlighted to the IAAF how Caster Semenya’s Rights are being violated. The Deputy Minister for International Relations is expected to address the High Level Segment as the country marks the last year as a back to back member of the council. The post SA ambassador calls for HRC to intervene in Semenya case appeared first on SABC News – Breaking news, special reports, world, business, sport coverage of all South African current events. Africa's news leader..